Fat and Happy Food Blog Tips and Techniques: For the hot pepper, I used a red jalapeno but any hot pepper will do. The goal is to give it a little spice without overwhelming. If you use a serrano or habanero you may want to use a smaller quantity unless you like the heat. 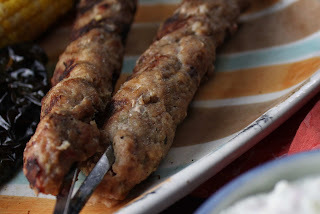 Also note you could turn these into a burger instead of a kabob; I tested it with half of the meat. What really made that stand out was the feta stuffed into the center of the burger- so delicious! You will need the cucumber juice from the yogurt dip below. 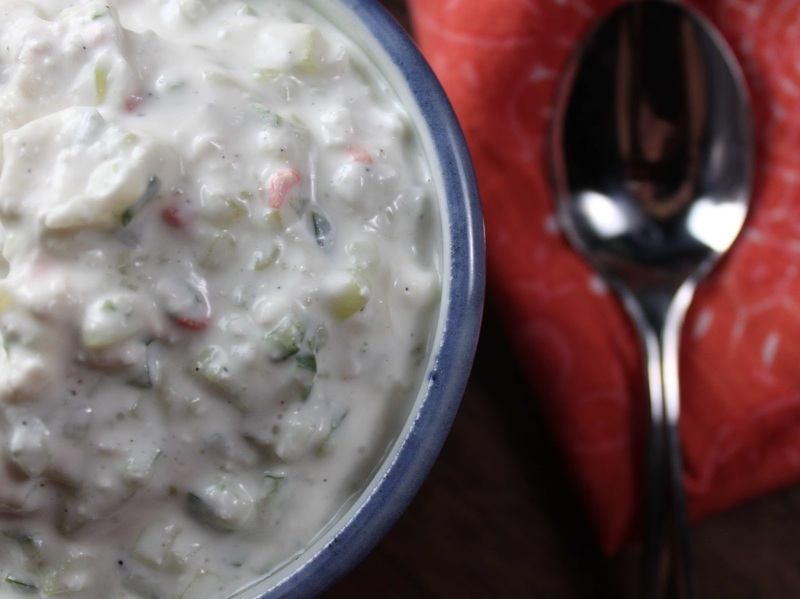 Chop the cucumbers and let sit to drain, make the yogurt dip and then make the meat mixture. Combine all the ingredients above expect the seasoning salt and juice, mix well. Let the meat mixture rest while the cucumbers finish draining, this will allow the flavors to meld and will ensure the meat is room temperature before cooking. Add the cucumber juice when it's ready, you should get about 1/4 cup or more. The meat mixture will be fairly loose, add more bread crumbs if needed. On a grill set to medium high heat, carefully set the skewers onto the grill. Don't move them until the bottom side is cooked; the meat will easily release from the grill when it's ready. If you force it too soon, the kabob will fall apart. Use a metal spatula to flip, now season the second side. Remove from heat, allow to rest 5 minutes. Serve with the yogurt sauce and a tortilla or pita. Dice the cucumber first, place in a strainer set over a bowl to catch the drippings. Salt the cucumber let drain far an hour. Mix the yogurt with the garlic, peppers and lime juice and set aside. After the cucumber has drained, add to the yogurt mix along with a pepper to your liking. I like a lot of pepper so added almost a full teaspoon of fresh ground. The feta should offer enough salt but add a pinch more if needed. Serve with the Mediterranean ground meat kabobs above.